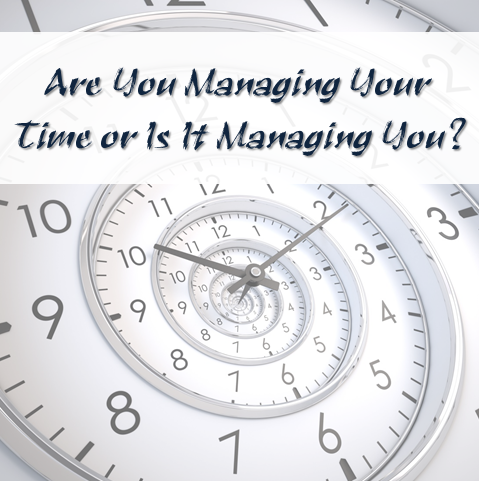 Time Management: Are You Managing Your Time or Is It Managing You? It’s amazing how much some people manage to get done, while others seem to be stuck in a rut without enough time in the day to accomplish much of anything. Time management is an art form. But, here’s a li’l secret. Everyone has the same amount of time in every single day. It’s one way in which we are all created equal. Everyone has the same 24 hours in a day. To get a real picture of how you spend your time, try tracking everything you do for at least one week. Use a small recorder to record when you start and stop any task, and include the time. Did you know? There’s an app for that! Alternatively, just use an old-fashioned pad and paper. I typically grab one of the dozens of notebooks I have, as it’s easier for me to track my time offline. Don’t change anything for now; just live your life as you do. Now look at how you spent your time. Organize each thing that you did into urgent, important, family, fun, and time drains. Some things that are fun might fall into the time drains bucket and that’s okay. You can place limits on some things to still allow yourself to have fun without going overboard into time wasting. Everything that is urgent and important should be scheduled. Some urgent and important things will also be family things. Put it all into the schedule. Give it the amount of time you think it will take. Then add a few minutes for padding to avoid run over and missed deadlines. Take the time each evening to evaluate how your day went. Next, decide what could have been done better, or what needs longer or shorter times to accomplish. If you do this you will get better at time management. Each morning, take the time to look over your schedule to remind yourself what is coming up so you don’t forget anything. Never rely on just memory or you will get off track. It doesn’t matter if the plan is for family time, for business, or something else. If you create a plan of attack for each item on your to-do list, you’ll accomplish it faster with fewer problems. Stick to one thing at a time until it’s done and you’ll feel as if you have a lot more time in your day. This is a big one, and can be a major tipping point in your better time management quest. If you have a business, especially if you work from home, you will often find that other people seem to lack respect for your time. The real issue is that you’ve not taught people to respect your time. As Oprah (or maybe it was Dr. Phil) once said, “You teach people how to treat you.” Are you teaching people to respect your time? If not, it’s time to start doing so. Never underestimate the power of delegation for getting more time in your day. A good assistant can almost double your time. So while you can’t actually get more time, remember that everyone has the same 24 hours. You can create a situation where you duplicate yourself by hiring an assistant or outsourcing some mundane tasks such as housework or lawn care. If you’re not quite (financially) ready to clone yourself, make a list of those time draining tasks you listed and delegate them, task by task. From bartering, to Fiverr, to hiring your teenage neighbor, you can find help! Remember, there is no such thing as a successful CEO who doesn’t delegate. Finally, it’s important to always be realistic about what can really be accomplished in any given amount of time. No matter how much you want to be, you’re not superwoman (or man). You’re just a human who is doing their best to manage the resources they have. If something doesn’t get done today, move it to tomorrow. It’s not the end of the world. As you get better at time management, you’ll get it down to a science on how long it really takes you to do any particular task. As a result, you’ll have fewer days where you don’t succeed.